This game is 100% real. No computers, no board, no cards. Just real dice, a real book, and real adventure. Anything that can happen in real life can happen when you play. Morton’s List is a game for small groups. Anytime, anywhere, with anyone – all you need is one hour, and a willingness to do something unexpected. Learning to play is easy, but describing what will happen is impossible. Every time you play, the game book gives you one of 360 different random real-life Quests, complete with ideas and examples to guide your group’s creativity. No two games of Morton’s List are ever the same. Possibilities include doing something you’ve always wanted to do, something you never imagined you’d do, and putting a twist on something you’ve done before, and every possible variation! Morton’s List is unending, ever changing good times waiting to be unleashed on your life. Where can I play Morton's List? What are some examples of these Quests? Quests include every possible activity in life - everything from quick laughs to eye-opening discoveries. Some are creative twists on popular games or sports. Others may just as likely lead to discovering a new favorite activity or doing something you've never done before. Read "Morton's Lite: 13%" from the Downloads section, These games closely parallel Morton's List and will give you a small sampling of the Quests in the game. Is Morton's List a MMORG / FPS / role-playing game / LARP / etc.? No. Morton's List is a Random Reality game that contains all entertaining group activities within it, including the above mentioned game genres as well as everything else. Every game and type of game is automatically a part of Morton's List. Claiming that Morton's List contains every fun group activity in life is pretty bold. How can this be true? This bold statement has never been successfully challenged. Morton's List was researched and written over seven years by three pioneering authors who traveled the Earth consulting with everyone from all levels of many societies. Every aspect of life is covered within the 360 Quests of Morton's List. Who can play Morton's List? Morton's List is played by tens of thousands of people across the English-reading world and beyond. Anyone who is looking for unexpected real-life experiences is a potential player. The best players are those not afraid to commit to an adventure, before they even know what it is. I have kids. Is it okay to play with them? There is no reason that children of any age can't have a great time playing Morton's List. Some Quests will require that extra guidance is used, but responsible adults can have an enjoyable with players of any age. I have pictures and stories of Quests that I would like to share. Where can I send them? Facebook is the best place to post photos or imagery. The same is true for tales of Quests. I have an idea for a sweet piece of Morton's List Merchandise that I want to sell. Who do I talk to about this? Who or what is Morton? This is the most frequently asked Morton's List question, and one that can only be answered by the asker, within oneself. The 360th Quest of Morton's List is titled "Find MORTON," and offers a starting place for this most personal of Quests and deepest of questions. Random Reality is a way of engaging and changing the real world with the unexpected possibilities of chance. This can be by making decisions with a coin toss or rolling dice, but any path of surprising, entertaining outcomes is a form of random reality. It is the opposite of stagnation and indecision, and shows the unexpected directions that life can take. What is a Random Reality game? A Random Reality game is generally made up of a list of possible actions, with players determining one of these through random means. It is important that no one knows exactly what will happen in the game until it starts. Every game is unique because who you are, whom you are playing with, and where you are playing at is never exactly the same. How are Random Reality games different from other games? Random Reality is different from other games in two ways. First, most other games involve substitution. In chess you pretend to be a king controlling an army on a checkered battlefield. It simplifies real life, distilling it down to a codified set of rules. In role-playing games you control an avatar or pretend to be a character taking part in a digital world or imaginary story. In a Random Reality games, you play YOU, wherever you are in reality. Second - In other games and sports you have an idea of what will happen before you play. In video or board games, no matter what it is about, you will be looking at a screen and working a controller or sitting around a table until someone wins. Random Reality games, by contrast, have no fixed components or outcomes. The only constants are the players and their setting in reality. Can Random Reality be dangerous? Random Reality includes every real-life activity, including physical sports and contests, social situations, driving, etc. - nothing more or less dangerous than real life. Just as life can be played safe or lived dangerously, so too with Random Reality. Wear safety equipment when applicable, know and follow the law, be careful, and use some damn common sense. This sounds kind of like The Dice Man by Luke Rhinehart - especially the similar themes of chance, randomness and allowing dice to determine your actions. Was that novel an influence? No. The Dice Man was written in the early 1970s (with several subsequent works published in the following decades), but the creators of Random Reality were unaware of any of it until 2005, long after pioneering the field and publishing Morton's List. What are Degrees, Titles and Powers all about? 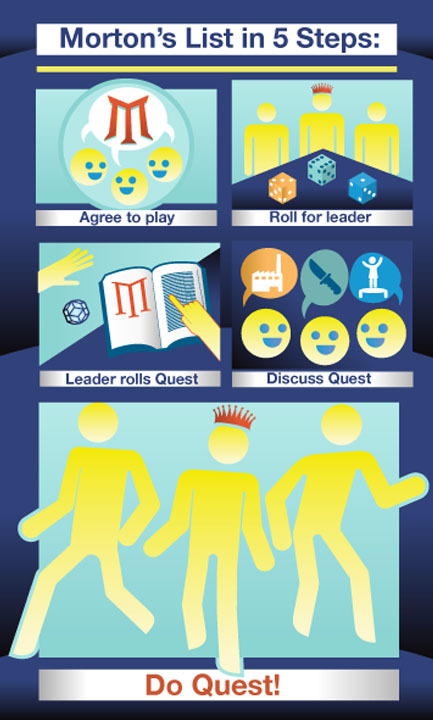 The supplement to Morton's List, "360 Degrees of the Inner Circle" contains rules that lay out an advancement system whereby players gain points, or Degrees, for completing Quests. Titles are awarded to players who reach certain Degree totals and confer Powers to influence the game. There are 360 Degrees and 13 Titles, with the highest being that of Twilight Lord. What is a Karmic Gathering? A Karmic Gathering is an official event, sanctioned by the Karmic Order of Twilight Lords for the purpose of spreading Random Reality. The rituals and specifics of a Karmic Gathering constantly evolve with the Inner Circle and location, but may take place on Friday the 13th with Twilight Lords in ceremonial attire, artifacts, a banquet, toast and other surprises only revealed to those in attendance. I want to host an official Morton's List event or Karmic Gathering. What do I need to do? If you would like to host an event, contact Center, informing them of the planned date and location. They will provide further information and guidance regarding promotion and what can be done to maximize the effectiveness of your event. Karmic Gatherings are necessarily much more involved, but Center is always accepting proposals. What is the SuperiCore Group? The SuperiCore Group is a secretive international organization committed to ending boredom through the spread of Random Reality books and events. The SuperiCore Group's mission is to help humanity break free from the patterns and habits that lead to stagnation, unhappiness and suffering.